As I mentioned yesterday, we took a little road trip on Sunday and stopped at the Hood River Lavender Farm. The view overlooking the gardens towards Mt Hood is spectacular. Funny, Mt Hood looks so odd to me from this angle. You are leaning the wrong way, my friend! This is breathtaking, like an impressionist painting. Amazing! This is so lovely, it's hard to believe it's real! Pinch me. Lucky you to have such views. We are so fortunate to be surrounded by so much beauty here in Oregon, aren't we!!! Gorgeous capture!! Love Mt. Hood!! Thanks for sharing!! Soooo.... pretty with the white capped backdrop. Picture postcard perfect. Whichever way Mt.Hood prefers to lean is fine with me :) As for the foreground, it is absolutely magical. Wow! Gorgeous shot of the lavender farm and Mt Hood! Happy Skywatching! Beautiful, I very like lavender! The lavender and the mountain look beautiful! A wonderful capture - love those "stripes" of colourful flowers. I adore the smell of lavender and the way they look planted before Mt. Hood. Wowza! Gorgeous and all the flowers too! Very very lovely! Love this. Beautiful subject matter--and so much depth of field. And you captured it perfectly. What a spectacular view. The flowers are gorgeous and then look at the background. Wow, wow, wow. A feast for the eyes, thank you for sharing! We have a lavender farm near my home, but the view is not near as spectacular. 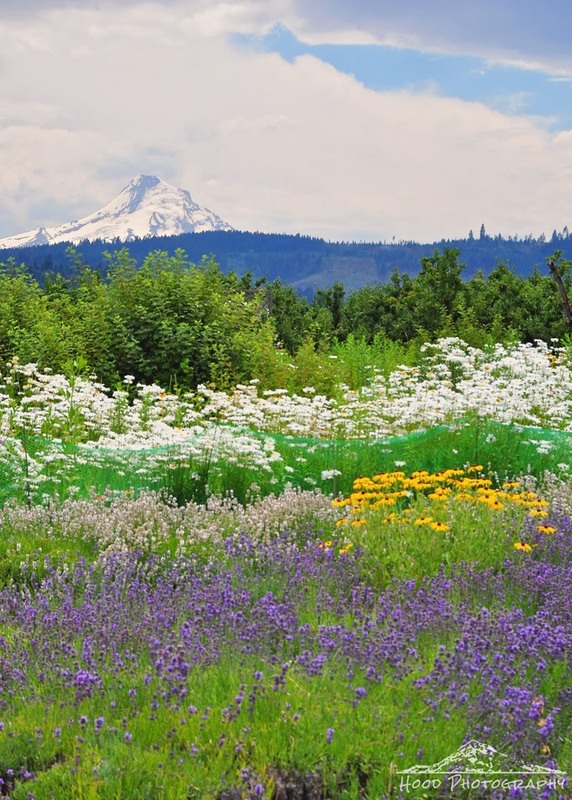 Seeing your photo, I feel inspired to drive over to the Hood River Lavender Farm. Your picture fills my eyes. What a great shot! I know what you mean about the 'wrong' side of the mountain. It's just weird.